If you glance at Eva Bierma with her smooth, alabaster skin, strawberry blonde hair and bright blue eyes, you would be shocked to learn that she’s not only a mother and grandmother, but a great, and great-great-grandmother. The Big Piney, Wyo. native was just a 6-year-old cowgirl on the Flying W ranch south of Yellowstone when her mother died. During the Great Depression, her father lost his job managing the ranch, remarried, and moved his family to Ohio, where he worked in the coal mines. Eva has been active all her life, she says, riding horses when she was young, working a number of fascinating jobs while raising a family, and more recently in retirement gardening, exercising and enjoying her family. 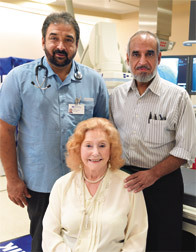 So it was a shock when she experienced a series of heart attacks Oct. 28, which ultimately landed her in NorthBay Medical Center’s cardiac catheterization lab for PCI—Percutaneous Coronary Intervention. It not only saved her life, it has given her a bounce in her step once more, says her doting husband, Harold. The two have been married for 55 years. Eva had her first PCI in 2004, when she needed a stent to help open a blockage. Back then, she and Harold had to travel to Walnut Creek for the procedure. That was difficult, explains Harold, because he couldn’t spend the night, he had to drive home and back the next day to check on her. Still, the procedure was a success, and she thought all was well. In retrospect, she says, she should have noticed that she was getting tired more frequently. She went to bed one night, only to wake up with severe pain in her chest and arms. At 3:30 a.m. she asked Harold to take her to the Emergency Department. She later learned she had suffered angina attacks at home, and a heart attack in the Emergency Department, before she was stabilized enough to undergo the PCI. The procedure is not surgery. The patient is only mildly sedated, explains Interventional Cardiologist and Medical Director Gurinder Dhillon, M.D. A catheter is placed in an artery in the groin, and a catheter line is run up toward the chest, allowing the physician to insert a balloon or stent, as needed. In this case, the doctor was Cyrus Mancherje, M.D., the same physician who had placed a stent in an artery leading to her heart before. But this time, Dr. Mancherje was able to do it in Fairfield, and Harold Bierma was able to go home and rest before coming back to check on his wife. Dr. Mancherje reinforced the previous stent and placed three additional stents to eliminate Eva’s blockage. She stayed in the hospital a few days for recovery, before going home.